Well it turned out to be Boro's last match of the season. I managed to win on the three goals or more in the final day defeat at Watford increasing the monies raised this season for the Great North Air Ambulance to £853.24 in conjunction with William Hills. 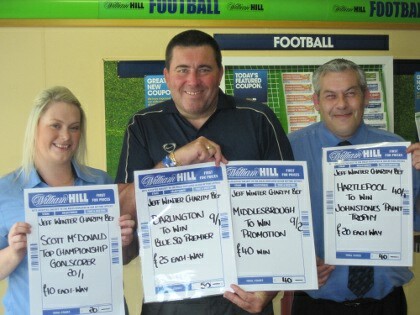 Many thanks for the bookies for their continued support, hopefully they will oblige again next season. Odds are often better online than in the offices, click here to open an account . Once again William Hills are supporting me with Charity Bets to raise funds for the Great North Air Ambulance. I received £150 for my season long bets and then £25 per week throughout the season. Last season I thought it was easy as Boro looked a good bet for promotion at the start of the season. As we all know now that was never going to happen. This season it is equally as hard, until the end of the transfer window we really won't know what squad Tony Mowbray is likely to have and if it realistically has a chance of having a successful season. Anyway I have to be optimistic, so I have had £40 on Boro winning promotion at the rather skinny odds of 9/2. Likewise I don't even know whether Scott McDonald will be with the Boro or indeed playing his football in the Championship but if he does stay then he is Boro's main goal threat and I have had £10 each way @ 20/1 for him to be the Division's top goalscorer. Down the A66 Darlington will be looking to build on their FA Trophy victory and I have had £25 each way @ 9/1 for them to get promotion back into the Football League. Hartlepool will be spurred on by bumper crowds at Victoria Park thanks to the club's excellent initiative with cheap season tickets. Regrettably I still don't think that they can maintain a promotion push but they could gain some success and reward the loyalty of their supporters with JPT glory. A trip to Wembley would go well with the Monkeyhangers, I have had £40 each way @ 40/1. Every week I will place my bets on a local game and you can usually get better odds online, so click here to open an account .